Yay! 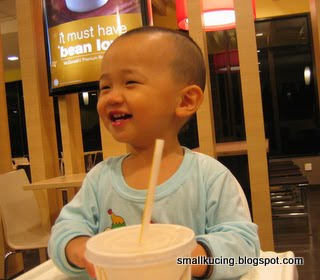 There is a new McD outlet at Subang Airport. It's located at the very end of the building. Not a very prominent location. Guess as late comer to the Skypark, don't have much choice loh. Everything is brand new. Hmmm....just smell the furniture smell or was it coffee smell?. I am not allowed to drink Coffee, so i guai-guai drink my "O-ju". That is my short name for Orange Juice. Hahaha...clever leh. The O-ju taste good. I am giving this place a Double Thumbs Up. next time I wanna eat McD breakfast, no need to go so far already. Oh so u lived nearby Subang? Free Wi-Fi / Wimax as well? 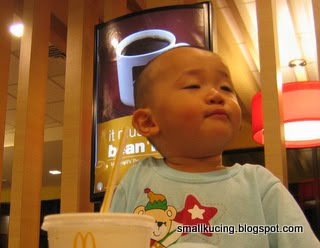 Wah,...smallkucing really knows how to enjoy his morning breaky at McD. Done sumething on the CIMB. The airport now looks so good already. CIMB, Maybank and etc all very nice. 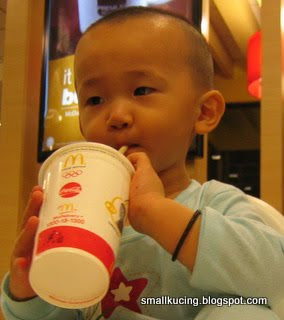 Mamma we never go to mac donalds why? hehehehe! 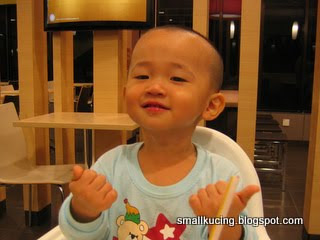 Khim one more thing what is Nasi Lemak..? Once in awhile going to McD is alright. At least the kids can have fun there. As for germs, like my boss said "Big germs/bacteria eat small germs/bacteria" kekeke. Wah pigi airport for breakfast? Ok we know where to go now for our next McD-attack :-) I have a feeling that we're living nearby, probably neighbours haha! That is a strong possibility :).